As you may already know, Recession Art just appeared at its first art fair, the Affordable Art Fair in New York. It was a fun and (semi) relaxed way to enter the big world of art fairs. While I was there, exploring and helping install art at our booth, I started thinking about the other art fairs that I have been to, such as Art Basel Miami and the many satellite fairs that its pulsating glow illuminates. 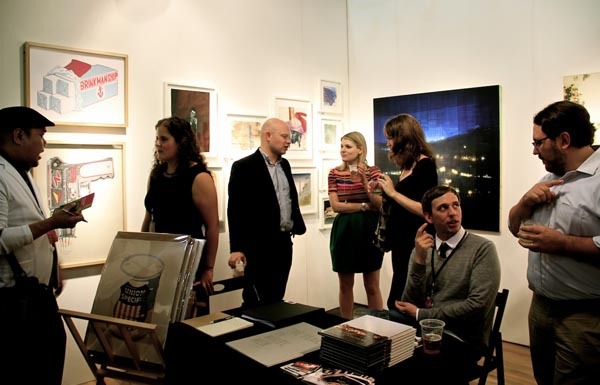 The primary purpose and function of art fairs in the U.S. is to provide a space for the buying and selling of art. The Affordable Art Fair, which began in London, is fascinating because it highlights the reference to money and the market like aspect of the art fair is part of its name. By advertising the fact that the fair supports emerging galleries, curators, and artists through its emphasis on affordable art, the fair has the ability to attract a diverse crowd of both experienced art collectors and those that are just getting their sea legs. I thought it may be interesting to compile a list of art fairs in the U.S. that are doing something kind of similar to the Affordable Art Fair. In some cases this means focusing specifically on art that is within a lower and therefore more affordable price bracket, but more often, these more alternative fairs focus on emerging artists, curators, and galleries. There even seems to be a growing trend towards allowing and encouraging unrepresented artists to show present their work. But before the list a little tip for our art collectors that are new on the scene. Here are two good terms to know for the sake of knowing, but also to help you distinguish between the more “affordable” art fairs and those that are more traditional and perhaps less “affordable.” The art market is split into the primary art market and the secondary art market. The first refers to art that is being sold for the first time maybe at a gallery or exhibition; it will be the first time a price has been established for the piece. Once a piece has been bought on the primary art market and the purchaser decides to sell it, it enters the “secondary market.” Most works at auction houses are part of the secondary market, and it seems that many of the art fairs that are more “traditional” feature a large majority of secondary market work. MDW Fair is a Chicago-based fair that was formed in the spring of 2011 as a collaborative project between the four Chicago based arts organizations: Public Media Institute (a nonprofit arts organization with an interest in community development through innovative arts programming), Document (a printing, scanning and exhibition space), Roots & Culture (a contemporary art center) and threewalls (a nonprofit arts organization dedicated to advancing contemporary art practice and discourse). MDW fair is a showcase for independent art initiatives, spaces, galleries and artist groups. As opposed to the more gallery-centric model of traditional art fairs, MDW tries to highlight artist-run activities and experimental culture. It is a hot destination to catch an eyeful of independent and grassroots culture that is fomenting on a local, national, and international level. In its third year the fair is a more expanded version of what it once was. It brings together artist-run spaces, publishers, and programmers from across the country, though with a very heavy focus on the local scene. If you happen to be in Chicago in November or live in Chicago, be sure to check this place out. The thing I find most exciting about this kind of project is that it is wholeheartedly embracing a collaborative model in which arts organizations partner up to create a space for the growth of a community’s culture. According to artinfo.com VOLTA has earned a reputation for being the “most accessible and pleasant” stop during New York’s Armory Week Fair. Though it may not be the most affordable option out there, it is dedicated to representing artists based on skill rather than social clout. It is an invitational show of solo artists’ projects, which means that it is a much more narrowly focused art fair that is perhaps more comparable to a studio visit than the madness that can sometimes characterize a traditional art fair. The fair was founded in 2005 by Amanda Coulson, art critic and fair director, in order to create a place of discovery that showcases current art production and relevant contemporary positions regardless of the artist or gallery’s age. VOLTA is made unique by its focus on solo exhibitions. (e)merge art fair is a Washington DC based art fair that presents emerging galleries and artists in an energetic environment. Their multidisciplinary programming encourages dialogue, creativity, collaboration, and discovery. The 2012 fair took place on the same weekend as the Affordable Art Fair in New York (October 4-7) and was hosted in the Capitol Skyline Hotel. They divide their programming into three sections: the GALLERY PLATFORM features galleries and nonprofit art spaces in the Capitol Hotel’s rooms, the ARTIST PLATFORM features unrepresented artists in the public spaces of the hotel, and the (e)merge educational platform features lectures, panel discussions, and (most interestingly in my opinion) tours given by experienced and innovative authorities on contemporary art. Fountain Art Fair was founded in 2006 by David Kesting, Lincoln Capla, and John Leo as a way to create a supportive exhibition space for smaller independent galleries, collectives, and artists that wanted the mainstream exposure that an art fair often provides. It has been hailed as the first of a new influential generation of alternative fairs that focus on accessibility and vitality. It has grown from its home in Williamsburg to represent 60 international avant garde galleries and projects. You can check out Fountain during Armory Week in New York (March 7-13). PooL Art Fair takes place in Miami, Martinique, Guadalajara, and New York. It is modeled after the traditional French Artist Fairs that gained popularity with Courbet’s 1863 Salon des Refusés, in its emphasis on unrepresented artists. They first appeared in New York under the title “New York Independent Art Fair” in 2000 and since then have been the premiere art fair devoted to unrepresented artists. Their mission is to create a meeting ground for outstanding artists that have yet to be recognized by the gallery system. Twelve years into their project, PooL Art Fair now accepts submissions from emerging galleries, contemporary art dealers, emerging curators, and nonprofit organizations. The fair, like so many others, happens during Armory Arts Week in New York. Unfortunately, this interesting New York based project which happened in 2011 has no website that consolidates their mission and future projects, so I am not really sure if it is scheduled to happen again in 2013. In any case, this was another alternative venue dedicating to featuring the work of unrepresented artists. All of the work was juried by a panel of leading arts professionals and the selected work was displayed on Pier 92. It provided the selected artists a chance to display their work in a professional setting surrounded by other talented individuals. Keep an eye out for this project, if it happens again it could be a great opportunity for collectors and artists alike. Featured Image Courtesy of Arte Fuse. 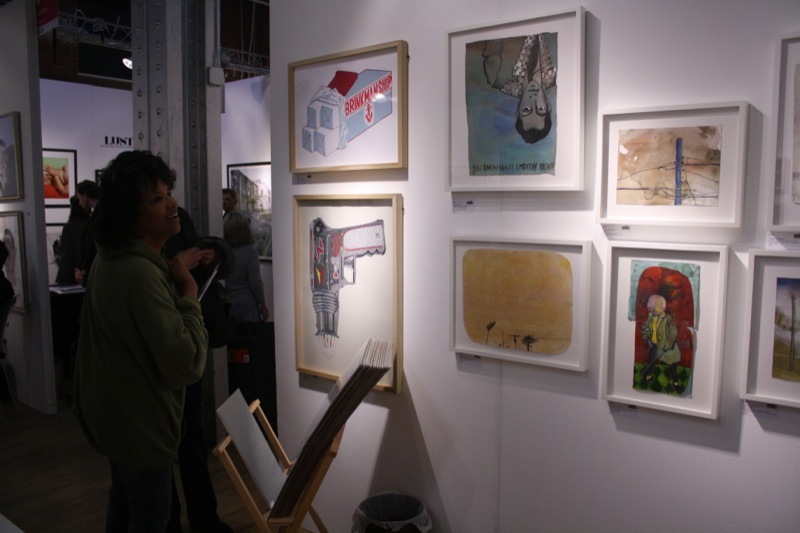 Take a look at their coverage of the Affordable Art Fair here.